Welcome to Myoko Powerful English Club (M-PEC)! 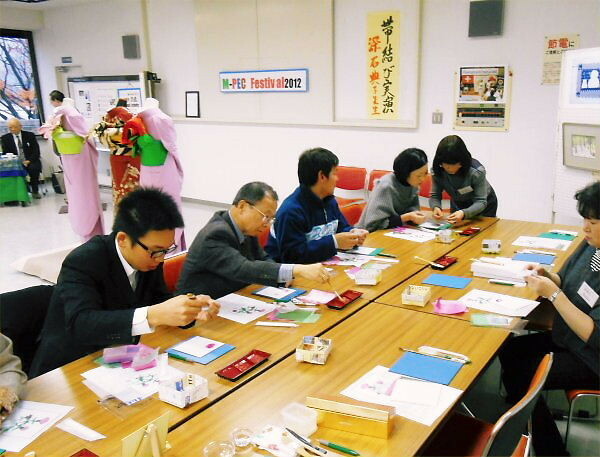 Yoshy is happy to often hear many people telling me, “I am asking you to re-start Monthly Lesson at least!” I decided to open it on the 3rd Saturday every month, from 7:00 to 9:00 pm at LL Shihoya Arai School. 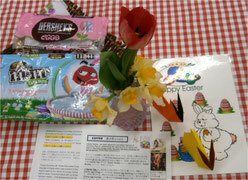 Monthly lesson material fee is only 500 yen for each lesson; membership fees are free. From J-S High School students and adults (available to all ages), welcome to LL Shihoya Arai School, the place of M-PEC Lessons. No ability of English command is NOT required. 会則等は下にございます。：Scroll down to read the Rule, etc. On Friday, November 22nd, an information form for “Pamphlet Introducing Activities of Volunteering Groups in 2013” arrived here, the office of Myoko Powerful English Club (M-PEC) from Myoko Community Support Center. They say it’s going to be handed in after being edited to every community facility around in the middle of next March. Yoshy soon filled in all required items on “the application to be posted”, sending it by e-mail in the evening of 22nd. One of those items was “an Ad for M-PEC”, which should be written for not more than 200 numbers of characters. Let me introduce the draft in advance. Dear every member of M-PEC and Yoshy’s friends, let’s rediscover our feelings in 2007, shall we? 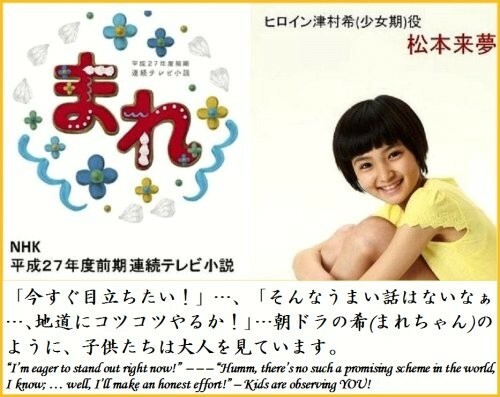 講座に集中していただきたいため、会則第6条と8条は、2013年度より一時無効です。Since Yoshy would like to have you attend and learn YEA (Monthly M-PEC Lessons) much more. 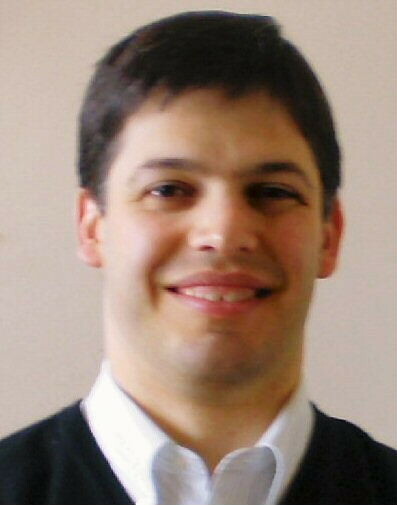 ✪Professor Timothy J. Wright (ティモシー・ライト教授) … 大妻女子大学社会情報学部教授(Otsuma Women’s University, School of Social Information Studies)・東京大学教養学部講師(The University of Tokyo, College of Arts & Science, Lecturer)・専攻、主な講演テーマ(Majors, Themes of his Lectures)：Teaching English to Speakers of Other Languages, English Speech, Oral Interpretation, Rhetoric, Speech Dynamics, Drama, etc. 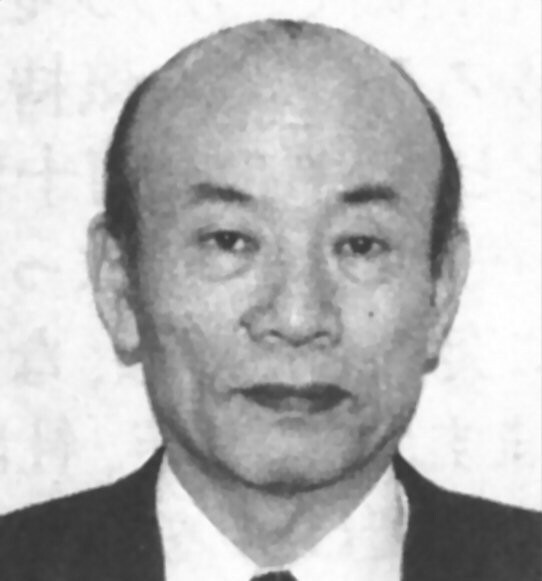 ✪橋口英俊教授 (Professor Hashiguchi Hidetoshi) … 東京家政大学名誉教授 (Tokyo Kasei University, Honorary Professor)・ルーテル学院大学臨床心理学専攻主任教授 (Japan Lutheran College, Head Professor) ・日本教育臨床研究所主宰 (IJEC: Institute of Japan Education and Clinical Psychology, Superintendent)・専攻：論理情報行動療法 (Rational Emotive Therapy)、臨床心理学 (Clinical Psychology)、東洋医学 (Oriental Medical Science)…etc. 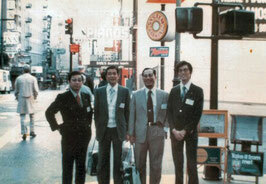 ✪Endo Yoshiaki being the representative of the association (President). 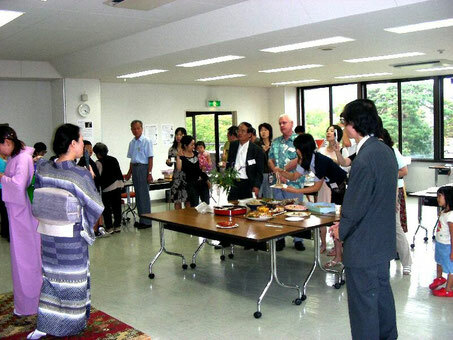 Article 3 (Purpose): We shall introduce the traditional culture of Myoko City to non-Japanese residents of Myoko City and the others and develop friendship with them while at the same time enjoying learning practical English. Article 4 (Activities): We shall develop effective activities to achieve this purpose and implement them. The Executive Committee shall make annual plans and carries them out. Below are some of the activities that may be proposed for examples. 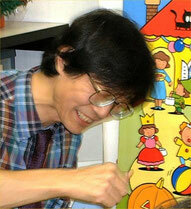 ・ To offer an English lesson by Endo Yoshiaki with a focus on spoken English once a month and a lecture. 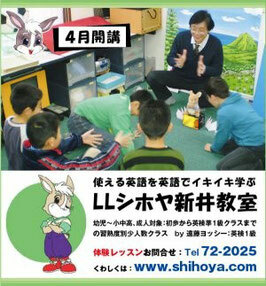 (YEA: Yoshy’s English Activity) It is to be held on the second Saturday, from 7:00 to 9:00 pm in LL Shihoya Arai School. 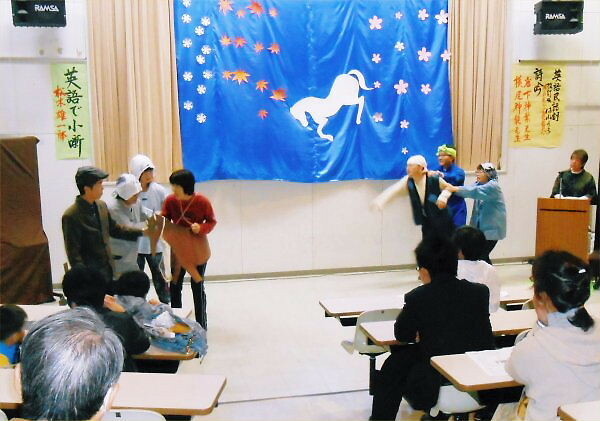 ・ To perform plays in English based on folktales that have been handed down in Myoko City. 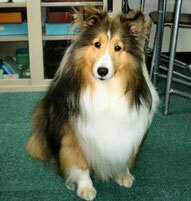 ・ To introduce tourist spots, special products and traditional events of Myoko City in English. Article 5 (Qualifications): Anybody who agrees with the purpose of the association may join in anytime, regardless of age and whether he or she lives in Myoko City or not. It shall be acceptable to leave the association anytime as well. Article 6 (Directors): The positions of officials of the association shall be taken up by President (Endo Yoshiaki), Chairperson, an auditor and several members of the Executive Committee. There shall be no compensation for them. Article 7 (Advisers): To facilitate management, several advisers shall be appointed. While there is normally no compensation for them, in case they give a talk for the benefit of our association, they shall be provided with travel expenses and expenses for the materials they use for the talk. The current special advisers are as follows. ✪Prof. 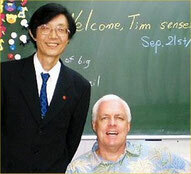 Hashiguchi Hidetoshi …Tokyo Kasei University, Honorary Professor・Japan Lutheran College, Professor・IJEC: Institute of Japan Education and Clinical Psychology, Superintendent / His Major: RET: Rational Emotive Therapy, Clinical Psychology, Oriental Medical Science, etc. ✪Ms. 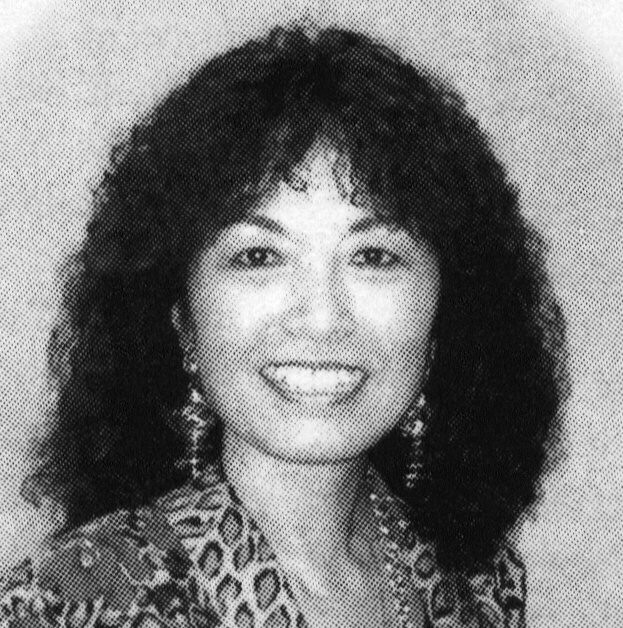 Keiko Abe-Ford …President of CALA: Communication And Language Associates・President of Hawaii Institute・Seigakuin University, Lecturer・Promotion of English for Children + Training for Public Elementary and Junior High Schools’ Teachers, Instructor・International Association TESOL: International Issues of Elementary Schools, Chairperson, etc. Article 8 (Membership Fees): The yearly membership fee of 3,000 yen shall be required per person, with the exception of the advisers and supporting members. Expenses of each activity shall be covered by regular members. M-PEC is always recruiting supporting members; a share-fee is 10,000 yen a year. The fiscal year of the association shall be from the 1st of April to the 31st of March. Article 9 (Audit): An auditor shall be appointed. (a) I believe that the type of English we can learn to use to make our lives exciting and enjoyable can be acquired outside of the classroom. This association shall be managed with this belief in mind. Its activities began in April 2007. (b) “Myoko Powerful English Club” and LL Shihoya Araya School shall operate independently of each other. “A Critical Comparative Review of Two Experimental Studies on the Critical Period Hypothesis in Second Language Acquisition." “Analysis of a Dataset of English Speech Spoken by a Japanese Learner of English." “A Critical Assessment of Brown and Levinson's Theory of Politeness in Relation to the Japanese Language." “How is Lexical Information Integrated into the PPT Model of Syntax?" “A Survey of Recent Empirical Research in the Social Psychology of Language."